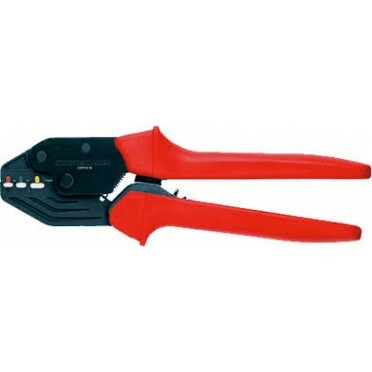 Connectwell Crimping Tools CRR0.5/6, Suppliers In India. a Crimping Tool, Model CRR0.5/6. This is suitable for crimping fork or ring type ferrules/lugs on wires from 0.5-6 mm2 sizes. 3 distinct colour coded positions are available for the appropriate crimp size. It has a burnished surface and has precisely ground prof.
A precision Ratchet tool for trapezoid crimping of wire ferrule from 0.5mm2 to 6.0mm2.Capacity: 0.5m..